After winning the Southeast Division with a franchise-best 97 points in 2006-07, the Atlanta Thrashers failed to provide a successful encore last season stumbling to a 34-40-8 record to finish 27th in NHL standings. Thrashers General Manager Don Waddell is hoping John Anderson, the fourth head coach in team history, can provide stability, excitement and motivation in 2008-09. Anderson has 30 years of experience in pro hockey as a player and coach, including the past 11 as the head man of the Chicago Wolves, the Thrashers’ American Hockey League affiliate since 2001. Former Rochester Americans coach Randy Cunneyworth and Wolves assistant Todd Nelson will join Anderson’s staff. Anderson will look to Ilya Kovalchuk for offensive support. The two-time All-Star finished second in goals with 52 goals in 2007-08. His 87 points were the second-highest total in his six NHL seasons. Slava Kozlov (17 goals), Bobby Holik (15), Mark Recchi (14) and Todd White (14) were the only other players to top 14 or more goals. Holik has since signed with New Jersey and Recchi is now with Tampa Bay. Goalie Kari Lehtonen, who was re-signed to a one-year deal in July, completed his third full season with a 17-22-5 record, 2.90 goals-against average a franchise-record .916 save percentage. Lehtonen said he is fully recovered from a groin injury he suffered last December that sidelined him 16 games. Waddell spent much of the summer retooling a defense that yielded a League-high 3.24 goals per game last season. In June, he took the first step in that process, drafting 6-foot-2, 197-pound Zach Bogosian. Waddell then signed two-way defenseman Ron Hainsey to a five-year deal on July 2. The Southeast Division has produced a Stanley Cup finalist in three of the past six seasons and Atlanta plays 32 of its 82 games against divisional rivals, so fortifying the back end was critical. When healthy, Lehtonen has proven to be one of the League’s most underrated goaltenders. The 24-year-old Finn is the Thrashers’ all-time leader in games played (158), wins (75), shutouts (11) and save percentage (.913). The Thrashers finished 15-15-2 within the division last season and a healthy Lehtonen could only help improve that mark. Seventh-season veteran Johan Hedberg finished 14-15-3 with a 3.46 GAA and .892 save percentage last season in 36 appearances, and 20-year old Ondrej Pavelec was 3-3 with a 3.11 GAA and .905 save percentage. Look for Pavelec, who is very familiar with Anderson’s coaching tendencies, to earn more time, particularly after the year he had in the AHL with Chicago. Pavelec went 33-15-4 with a 2.77 GAA, two shutouts and a .911 save percentage for the Wolves. 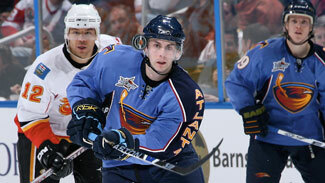 Bogosian, Atlanta’s first-round pick (No. 3) in 2008, was certainly impressive at prospect camp and could very well be paired with Hainsey if he makes the team out of training camp. Hainsey, the 13th pick in 2000, scored all eight of his goals with Columbus last season on the power-play. The biggest surprise last season was the play of rookie Tobias Enstrom, who was first among Atlanta defensemen with 38 points – sixth best on the team – in 82 games. Anderson could keep Enstrom paired with his partner last year, Niclas Havelid, who ranked second among Atlanta defenders with 14 points (13 assists). The Enstrom-Havelid pairing was the most dependable of any D-line combo the Thrashers had last season. While Garnet Exelby and Ken Klee, who was signed to a free-agent contract in 2007, round out the current active roster, don’t be surprised if either 6-foot-7, 230-pound Slovakian Boris Valabik or 6-foot-2, 200-pound Latvian Arturs Kulda earn some duty along the blue line at some point this season. The signing of versatile forward Jason Williams – perhaps one of the more overlooked free agents on the market this summer – to a one-year deal on July 14 gives Anderson some additional options on right wing following the departure of Recchi. A preliminary lineup could include Todd White, who had 14 goals and 37 points in 74 games last season, centering for Kovalchuk and Colby Armstrong (4 goals, 11 points in 18 games with Atlanta). This could be the year for the 25-year-old Armstrong to take that next step. He established career-high totals of 16 goals, seven power-play goals, 24 assists and 40 points in only 47 games with Pittsburgh in 2005-06. Bryan Little (6 goals, 10 assists in 48 games) could work the middle for Slava Kozlov and Williams on another line. Kozlov finished fourth on Atlanta with 41 points and Williams had 23 assists and 36 points in 43 games with Chicago last season. Kozlov’s point total was his lowest in a season in which he played at least 47 games. Anderson is hoping the 36-year-old Russian can return to the form of 2006-07, when he registered 28 goals and a career-high 80 points. Another unit could find center Erik Christensen, who had 2 goals and 2 assists in 10 games with the Thrashers following his trade from Pittsburgh, with Brett Sterling and Colin Stuart. Christensen, originally selected by the Penguins in the third round of the 2002 draft, was dealt to Atlanta along with Armstrong, Angelo Esposito and a 2008 first-round draft pick (center Daultan Leveille), for Marian Hossa and Pascal Dupuis on Feb. 26. Eric Perrin, who skated with Thrashers prospects Esposito and Danick Paquette during an informal scrimmage, could then be joined by Eric Boulton and Chris Thorburn. Center Marty Reasoner, Esposito and Junior Lessard should also fit into the rotation. Reasoner, who signed a free-agent contract on July 17, appeared in all 82 games for the Edmonton Oilers last season. In addition to scoring 11 goals and 25 points, he sported an impressive 52.8 percent face-off winning percentage. * Zach Bogosian. The third-overall pick in 2008 was the undeniable star at prospect camp from July 8-13 in Duluth. He exhibited plenty of offensive flair, unloaded some big hits and came away unscathed in the fitness tests. On top of that, he dealt with the media spotlight like a seasoned veteran. In 127 career games with the Peterborough Petes of the Ontario Hockey League, Bogosian posted 18 goals, 94 points and 135 penalty minutes with a plus-2 rating. He ranked second among OHL defensemen with 50 assists and was the only defenseman in the league to lead his team in points (61) in 2007-08. * The return of Kovalchuk, who topped at least 75 points for the fourth-straight season after finishing with 87 in 2007-08, including a team-leading 52 goals. In May, Kovalchuk scored a pair of goals in the championship game against Canada at the World Championship in Quebec City. His game-winner in overtime of a 5-4 victory enabled Russia to win its first gold since 1993. * First-year coach Anderson, 51, will provide a renewed energy throughout the dressing room that could go a long way in promoting exuberance and intensity on the ice. Anderson won five championships in 13 seasons as a head coach and led the Chicago Wolves to the American Hockey League’s 2008 Calder Cup Championship.